30%T/T in advance,balance against before shipment. Wooden Pallet, Wooden Crate with Seaworthy Protective Film. 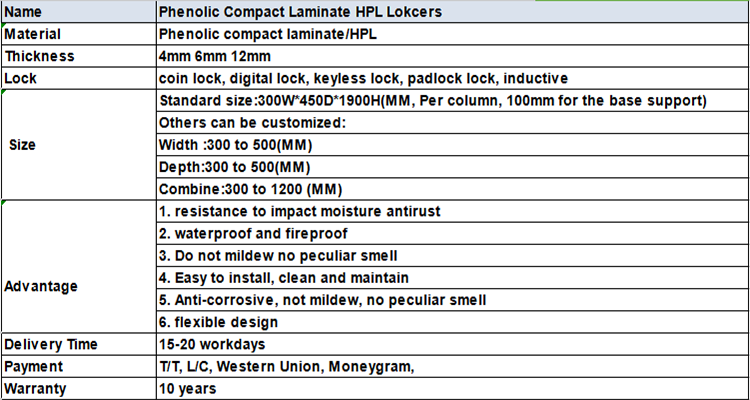 These HPL lockers are suitable for high humidity areas, such as fitness clubs, sauna rooms, swimming pools and sport centers, however, they are also widely used in schools, hospitals, shopping malls and hotels that have an extensive range of style and specification. Jiangsu Jiashida Decorative Materials Co.,Ltd. Brikley Cleantop High Pressure Laminate and the Compact Laminate are sheets consisting of layers of papers impregnated with thermosetting resin, dried and bond together in high pressure process. The exhaust air extracted from the drying is threated by regenerative thermal oxidation in which heat produced thereby is redirected back into the process. By executing this new production system in China, our plant can thus reduce its emission by approximately 6,000 tons of CO₂ per year. The kraft papers we used are mostly recycled papers ( also called “regenerated papers") which are from waste papers processed into “kraft papers”. Meanwhile, we also use wood-based kraft papers in the raw core to achieve balance of the sheets. We source these raw materials from vendors certified according to standards of FSC or PEFC . These standards ensure that the recycle content or wood is produced in compliance with international applicable rules for sustainable forestry. The laminates are cured and chemical inserted. However, the volatile organic compounds emission from the surface and the core are very low duo to its bonding production technique. The panels do not contain limited substances that listed in the Candiate of Substances of Very High Concern ( SVHC ) for authorization published by European Chemical Agency ( ECHA ) on and before 2017. Chips and shavings produced by processing ( cutting and milling) are not hazardous to human health. This also means that waste can even be disposed of thermal without the emission of environmental toxins such as hydrochloric acid, orgaanic chlorine compounds or dioxins. Principally, the waste must be disposed according to specific country laws and regulations.